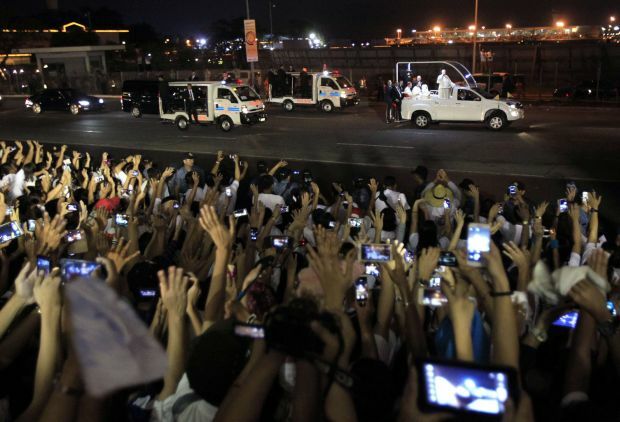 MANILA, Philippines (CNS) — Pope Francis shot past the crowd very quickly during his first popemobile drive-by in Manila Jan. 15, but nobody seemed to mind that he was gone in a matter of seconds. Ferdinand Agood, a retired overseas contract worker who lives on the opposite side of Manila from the papal motorcade, only saw the pope’s back. Sonny Rodriguez, 51, also saw just the pope’s back, but he told Catholic News Service he felt very happy. He is a street vendor who has spent countless years making a living by selling single cigarette sticks on Quirino Avenue, where the pope passed. Crowds were ecstatic at the sight of Pope Francis. They cheered as they stood at video monitors set up around Manila’s biggest public park, watching the first moments after the pope stepped off the plane at Villamor Air Base. Seeing the pope in person was also the first for Elpidio Balthazar, who drives a motorcycle passenger sidecar. He told CNS he missed St. John Paul II’s last visit 20 years ago. This time, he felt lucky that Pope Francis was so close to his usual route, which is right on the edge of Rizal Park, where the pope will celebrate Mass Jan. 18. He said he was planning to take his wife and three children to the Mass at Rizal, which is expected to draw millions. Marietta de la Cruz, 56, a high school economics teacher, and her two adult children transferred three times on public transportation to get to Manila from her far north Quezon City neighborhood. De la Cruz and her family had a plan to catch the pontiff’s attention. They took up their posts at 10 a.m. on the edge of the sidewalk along Quirino Avenue. They had to wait until well past 6 p.m. to carry out their plan. “We shouted, ‘We love you! We love you! Pope Francis! We love you!’ and he turned around,” she exclaimed. She said he smiled at her and her family and waved. “I got goose bumps,” said De la Cruz.